What's not to like? Hundreds of venomous snakes are released on a commercial airline flight from Hawaii to Los Angeles. 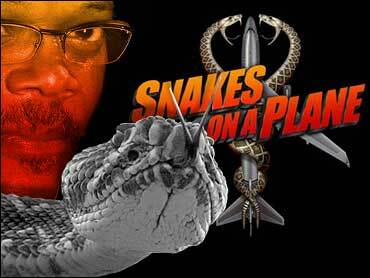 Based on this simple plot line, "Snakes on a Plane," starring Samuel L. Jackson, has become an Internet sensation. The New Line Cinema movie isn't due out until mid-August, but a horde of online film critics have already declared it to be a smash hit. And why not? You've seen the snake movies. You've seen the terror-in-the-sky flicks. Now — at last — Hollywood has put the two together in one late-summer B movie. "When the movie has the chutzpah to actually name itself by its ridiculously campy, C-movie logline (a one-sentence summation of a script) then how can you not love it?" says Seth Abramovitch, associate editor of the popular gossip blog, Defamer.com. "Snakes" has inspired online songs, music videos, apparel, poster art, parody films, and mock movie trailers (the real trailer won't be released until May). Several companies are busily turning out "Snakes on a Plane" T-shirts. It's just about unheard of for a Hollywood studio to do no publicity for such a film and to have the buzz for the flick reach epic proportions a year before it is released. But that's exactly what's happened with "SoaP" as the film is known on the Internet. The term "Snakes on a Plane" has even entered the lexicon. Urbandictionary.com describes it as "a simple existential observation that has the same meaning as 'Whaddya gonna do?' "
The online buzz has been so intense that the producers went back for five more days of shooting months after "Snakes" was complete, says Ray Richmond, a critic and entertainment columnist for The Hollywood Reporter. The largely young and male "Snakes" fans expressed deep disappointment with the film's PG-13 rating. The extra shooting fixed the problem: "Snakes" now has R rating. One line in particular is said to have been added to appease the movie's youthful online fans. One "Snakes" aficionado, Chris Rohan of Bethesda, Md., created an well-received R-rated audio trailer that uses a Jackson sound-alike shouting, "I want these motherf***ing snakes off the motherf***ing plane!" While the movie's director, David Ellis, has been hesitant to directly attribute that line to bloggers, there's no denying it now appears in the movie. The film features Jackson as an FBI agent guarding a witness who is flying to Los Angeles to testify at the trial of a crime lord. But there's more than frequent flier miles in the future for this pair. The mob boss arranges for hundreds of hungry serpents to come slithering into the cabin. "You see this type of buzz for movies like 'Star Wars,' 'Lord of the Rings,' typical big blockbusters," says Paul Dergarabedian, president of box-office tracker Exhibitor Relations. "But for a film that's a very high concept horror film with a solid cast, it's unusual." The online feeding frenzy began last August when a screenwriter named Josh Friedman posted an entry about the movie on his blog. "It's a title. It's a concept. It's a poster and a logline and whatever else you need it to be. It's perfect. Perfect. It's the Everlasting Gobstopper of movie titles," Friedman blogged. From this one post, word began to spread quickly. "This is not buzz about a movie, this is an Internet meme. 'Snakes on a Plane' is like All Your Base, Mahir, Hamster Dance or Yatta," Brian Finklestein, who writes Snakes on a Blog, explains. "These things all have a combination of appeal and quick reward that makes them seem to suddenly burst from obscurity to extreme popularity within a matter of moments. One day nobody's heard of 'Snakes on a Plane,' then everybody has heard of it and has written a song to commemorate it." "I'm just along for the ride," says Finklestein, a Georgetown Law student widely credited with spreading the buzz online. He has also mounted a campaign on his blog to score tickets to the movie's premiere, and has collected 500 signatures so far, and his Web site has become the clearinghouse for all things "SoaP." The Internet has long had the power to transform relatively unknown people or acts into stars (think "Lazy Sunday's" success), but not since "The Blair Witch Project" has a Hollywood studio been able to capitalize on a built-in audience, months before it even had a finished product. But its campy, concept-driven title has given New Line Cinema the ability to do just that. "It's crazy and overwhelming and good!" director David Ellis told Bloody-Disgusting.com. And New Line Cinema is reaching out to their online fans by approaching them, yes, online. Online marketing works, Dergarabedian of Exhibitor Relations notes, but it has to be for the right movie. "You have to look at who's online, who's the audience for the movie. For this movie, it's a perfect choice because it will appeal to younger audiences," Dergarabedian says. In response to the songs already created online as a tribute to the movie, they've joined forces with TagWorld, an online "social community," to launch a unique music contest tied to the movie. The contest gives musicians the opportunity to have a song featured in "Snakes on a Plane" and on the film's official soundtrack. TagWorld members will vote on submitted tracks, narrowing the competition to 25 finalists and from there, the filmmakers will choose the winning selection. Paula Gould, director of public relations for TagWorld, says the contest is catching on like wildfire because of the intense interest in the film. They've already received hundreds of submissions and as many as 1.7 million hits on their contest site. The day the contest was announced March 16, TagWorld already had several hundred visitors, Gould says. But none of this early attention guarantees ticket sales come August. "All your ducks have to fall in a row perfectly to make this happen. For 'Blair Witch,' it was all timing. This may be peaking a little early," Richmond cautions.